The principle behind this assumption may be fading as ad platforms have come under scrutiny for their cavalier approach to data security. Sure, people may be more likely to â€œengageâ€� with an ad that highlights one of their personal interests. But many folks are not amused by how the ad targeting sausage gets made, now that perpetual news stories about Russian troll farms and data leakage have propelled the mechanics of ad tech into the spotlight. In an April survey of 1,051 US adult internet users by Janrain, most respondents said they are not in favor of websites or apps using what they learn about them online to target ads. Nearly 70% of those polled said they would like to see the US enact a law similar to the European Unionâ€™s General Data Protection Regulation (GDPR), which states that a user's data can only be used if they give a company permission to do so. The provision of the GDPR that respondents most wanted to see applied in the US is an individual's right to ask companies to delete the data they have collected. Janrainâ€™s study isnâ€™t the first to show that consumers are irritated with the current state of ad targeting. 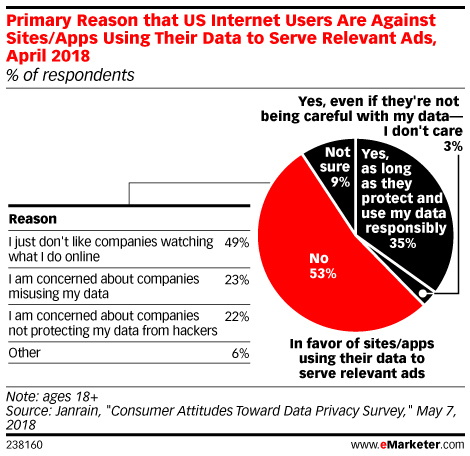 In a similar poll of 2,204 US adults by Morning Consult, 63% of respondents said they arenâ€™t willing to give up personal data for targeted advertising in order to keep using a service for free. Big tech backlash probably wonâ€™t prosper in the US like it has in Europe. But companies that rely on unfettered access to user data would be wise to listen to peopleâ€™s complaints, and pay attention to the data regulations being considered by lawmakers in California, as well as the law Vermont just passed to regulate data brokers.